Sigh, Halloween decorations are taken down and stacked in piles around my house waiting to be put away for another year. 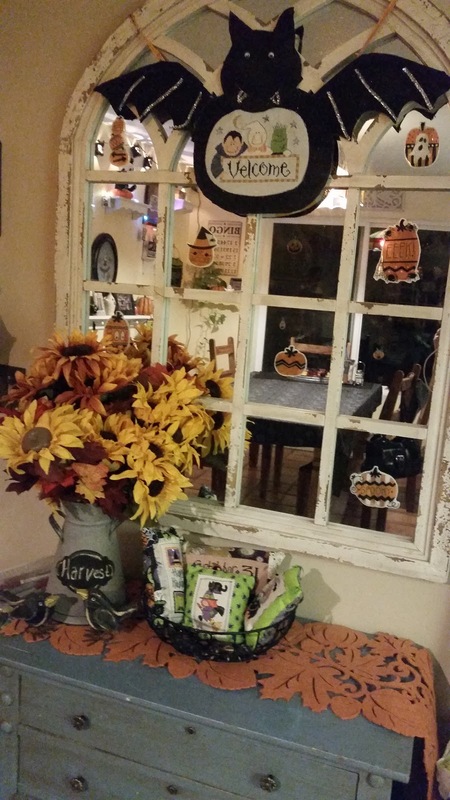 I have my Thanksgiving decorations up and will post a photo in my next post. After the excitement of Halloween the Thanksgiving stuff feels like a bit of a let-down. 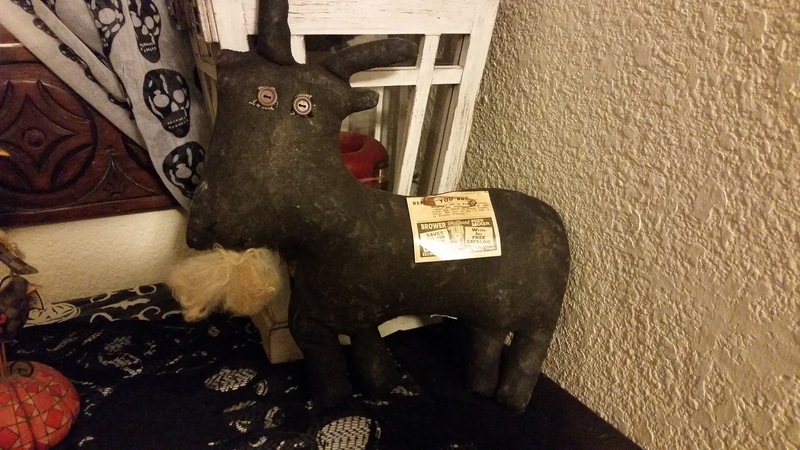 But I am getting excited for putting out the Christmas decorations. I am also getting started on stitching and finishing some Christmas ornaments. The top one is a Lizzie Kate out of this years Just Cross Stitch Ornament issue. It took me two days to stitch, and I challenged myself with the trim on the finishing. I love the ric rac, and pom-poms but they took some fussing to get right. And the little reindeer is from the December snapshot chart by Pine Mountain. Very cute, and very simple all DMC threads with the charts and quick to stitch up. As you can see I have done some stash enhancement this month. The Sunshine on a Stem chart I fell in love with while watching Cathy Haberman on flosstube. 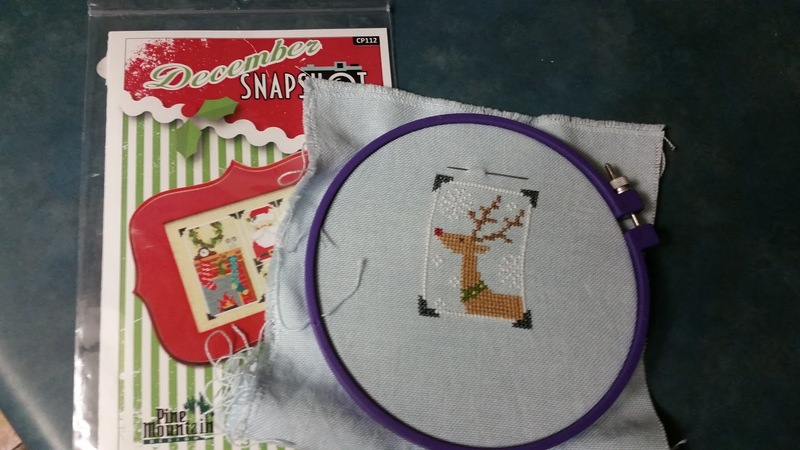 I can't wait to stitch it, but will probably wait till spring as I am occupied with ornaments now. 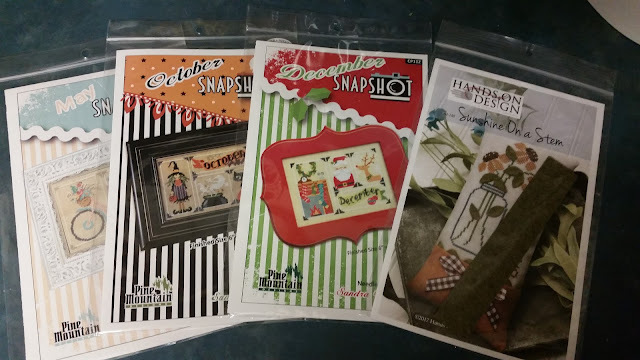 I also ordered the December, October, and May Snapshot charts from Pine Mountain, they are very cute and of course my favorite is October with the little witch and black cat. I also discovered a new designer (new to me at least) this month-Artful offerings. My middle daughter loves penguins, so she will be her ornament for this year. And I love bunnies wearing crowns, so he will be on my spring stitching list as well. 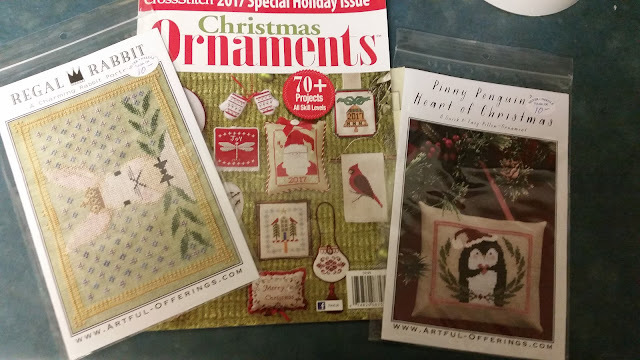 I also picked up the JCS Ornament issue, and found about 10 ornaments I want to stitch out of it, so I would say it was well worth the purchase. And here is my last Halloween finish. Bent Creek's "Spooky Row". I hand-dyed the fabric myself, but discovered I did not have quite enough to stitch the cauldron. 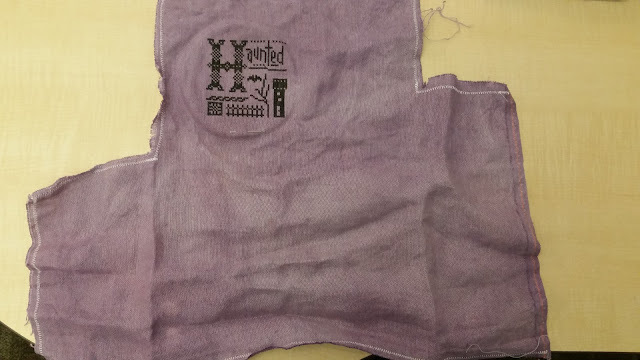 So I improvised and used a purple fabric and sewed them together. I am going to do some black X's on the seam line to make it look intentional and Halloweeny. 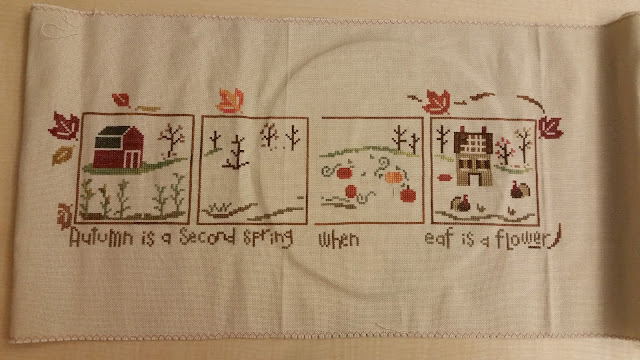 I have loved this design for a long time, and am glad I finally stitched it up. I have the other half of this fabric too, and want to stitch the "Trick or Treat" row on it. "I'll have your guts for garters girl!" 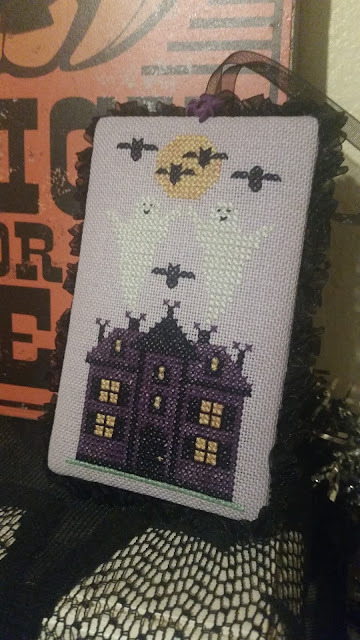 Ha, I couldn't think of a good title, and we have been watching all of our favorite Halloween movies this month- do you remember which one this is from? 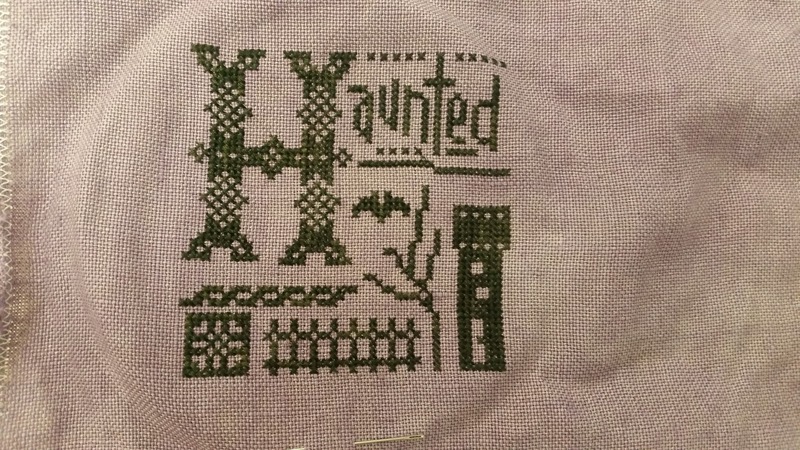 Halloween is fast approaching, and I have been trying to catch up on my Halloween finishing to no avail! 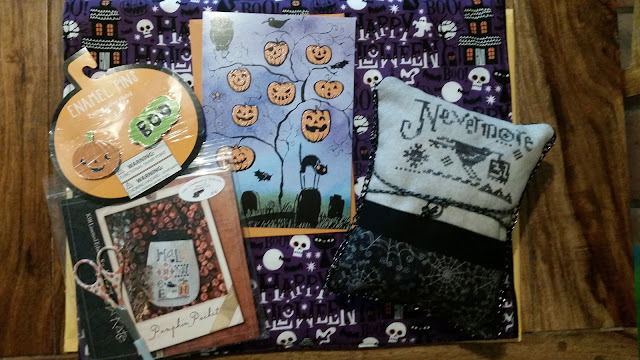 Christina of Whilst Iris Naps and I did a Halloween exchange this year. Below is what she sent me, and her finishing is as usual gorgeous. The linen is a light dusty purple, and the ruched black trim edging is just awesome. Do you see the little purple spider button at the very top too? And here are all the extra goodies she sent me. Three Crescent Colors threads in some beautiful oranges, a cute little pair of orange scissors, a drawn thread chart, and the fabric in the back the skulls are actually glittery (you can't see it in my photo). And here is what I sent off. I made a project bag using Vonna's tutorial on Youtube. I have made two of these now for myself, and like using them much more than the gallon ziploc bags I was using before. 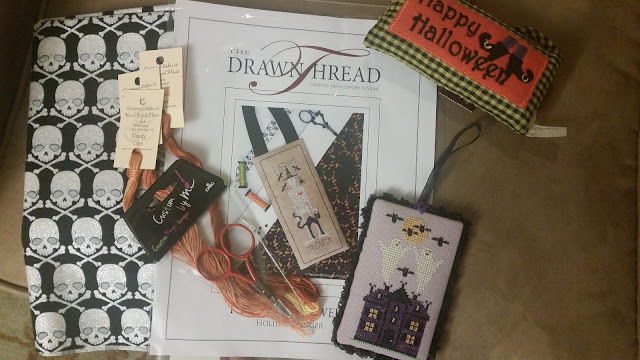 The little pumpkin pins were from Target, a Lizzie Kate Halloween pattern, a pair of scissors with cute pumpkins on them, and my stitched piece. My stitched piece was another LK pattern, and I edged the little pillow and made the hangar out of some black chain I found at Hobby Lobby. I thought it was unique for a Halloween finish. So October is always a busy month for us. 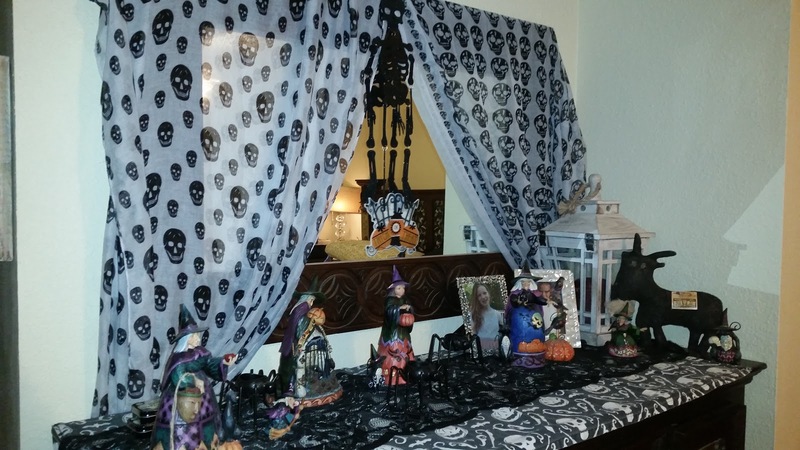 I think I decorate more for Halloween than I maybe do for Christmas! Also the AZ state fair comes to town, and while I normally try and enter a stitched piece this year I did not have anything framed and worthy of going. So I'll show you everyone else's lovely work. Below is an Ink Circles design "Cirque Des Cercles". 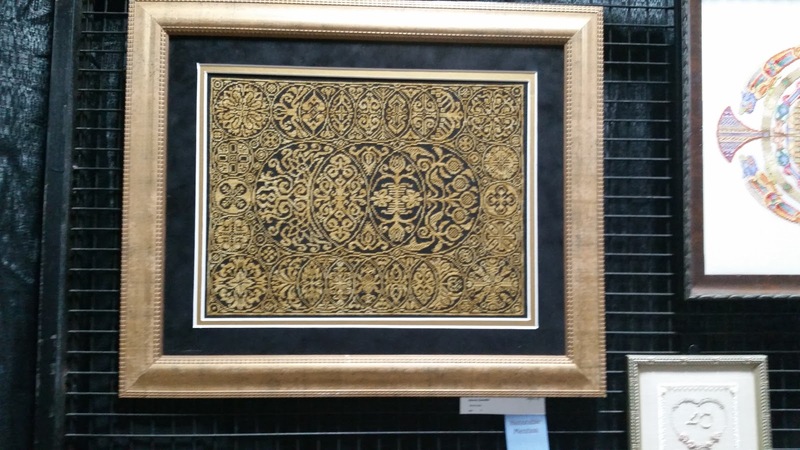 I have seen this before, but stitched on that dark linen with the beautiful variegated gold it is just breathtaking. 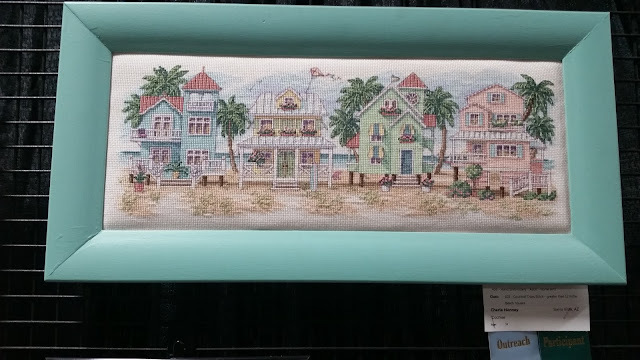 I don't know the name of the following stitches, but enjoyed seeing the variety of what everyone is stitching. I think it is good for the public to see too, that cross stitching has all these beautiful different styles and is not just a grandmothers hobby. I am hoping to get one more post in pre-Halloween, I have lots more to show before having to put it all away for next year. 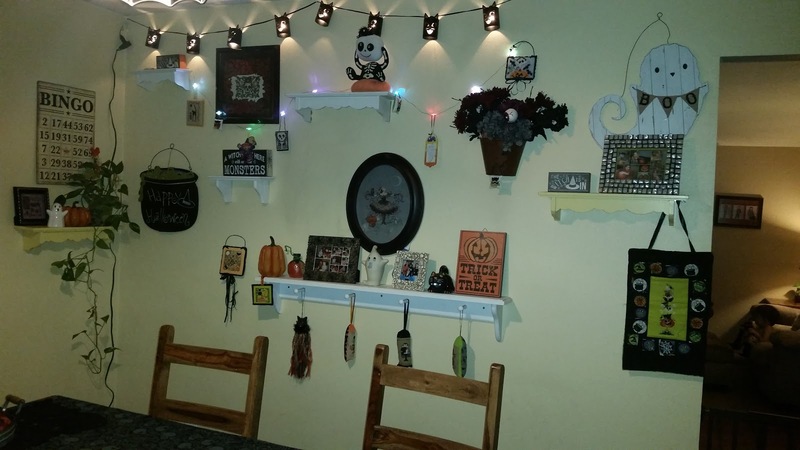 I had a discussion with my husband that some people start Christmas decorating at the beginning of November, so why couldn't we just leave our Halloween decorations up until the end of November? He shook his head, but seemed to understand my love of all things spooky. I have sooooo much to show you! 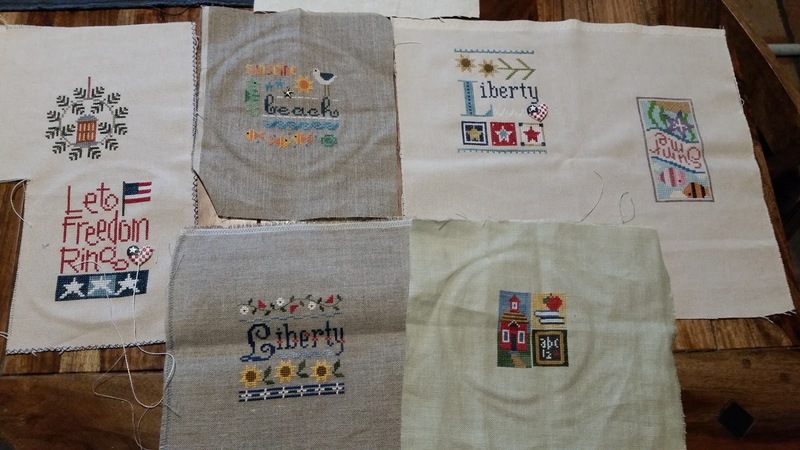 While I haven't been a busy blogger, I have been a very busy stitcher! So I have lots to share. Our Fall season has been super-busy but super fun! We have been doing lots of weekend trips out of town to enjoy the cooler weather and fall colors up north. But lets get to the stitching first. 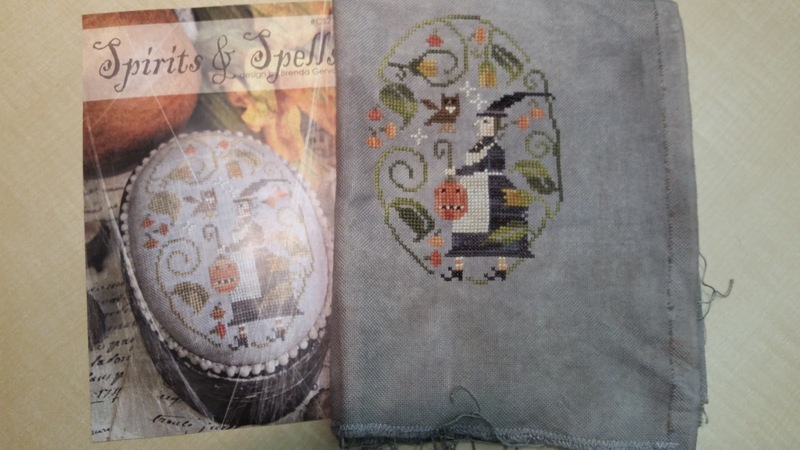 Above is "Spirits & Spells" a With Thy Needle and Thread pattern. I hand-dyed this linen, and I used little gold beads for the buttons on her collar, and did french knots for the owl's eyes. This is such a cute design. I did change the color of the leaves to CC "Pea Pod" it had a lot more variegation than I expected, but I love the pea-soup color. 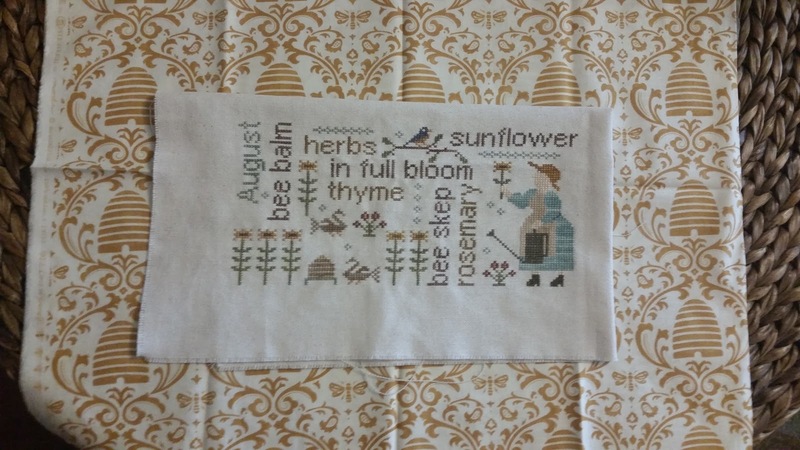 And I have continued stitching on the word-play series by Country Stitches. I have now finished July/August, and half of September. 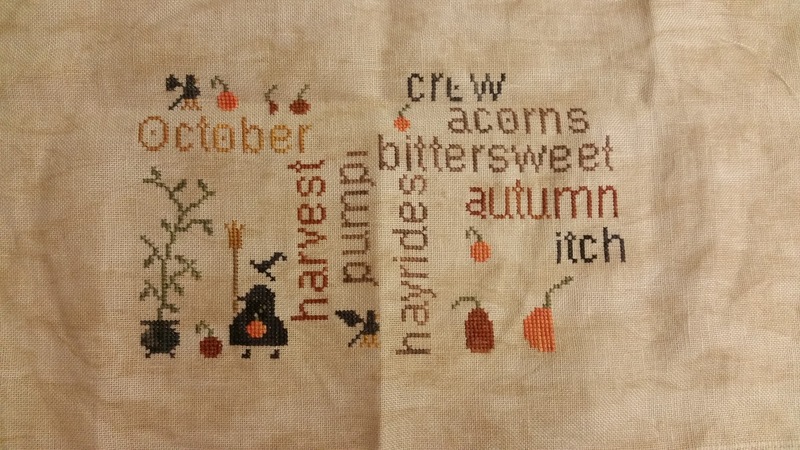 Here is October mostly finished. 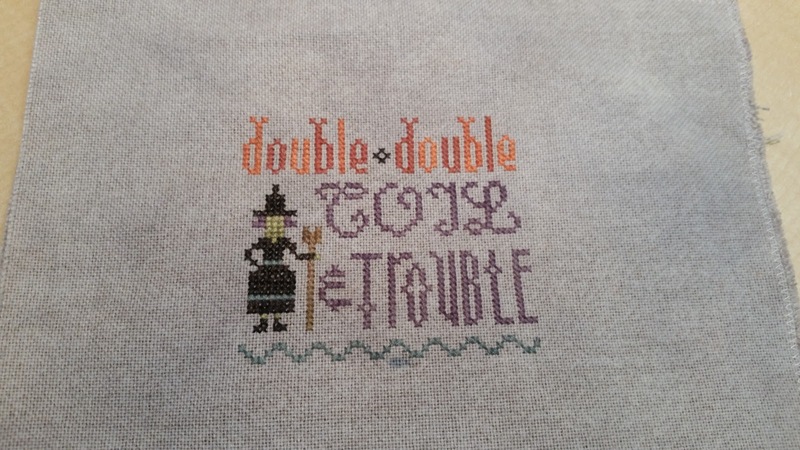 I don't like the blank spot to the right of the witch and am thinking of stitching another crow to fill it in. I do love the tiny little witch though. Calvin (my toddler) has taken to calling witches "shadows" this year. I don't know where he got that from, but I kind of like it. Another tiny finish. 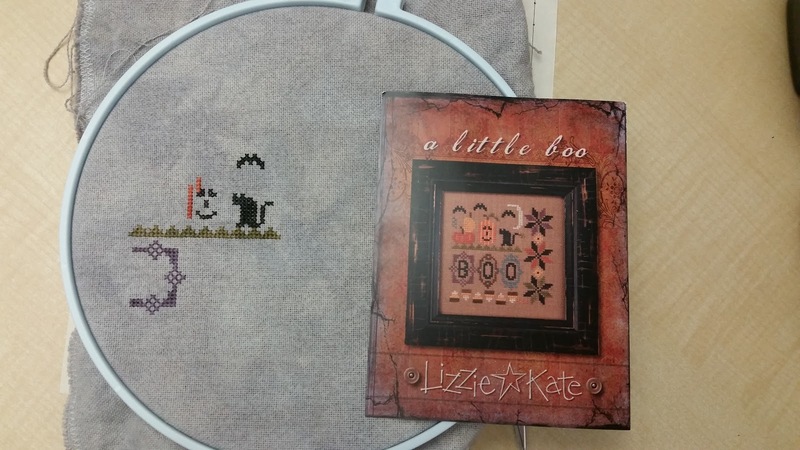 A Lizzie Kate pattern out of a JCS Halloween issue. I changed the colors of the lettering, and like how I did alternating colors in the top letters. And here is some of my Halloween decor at home. 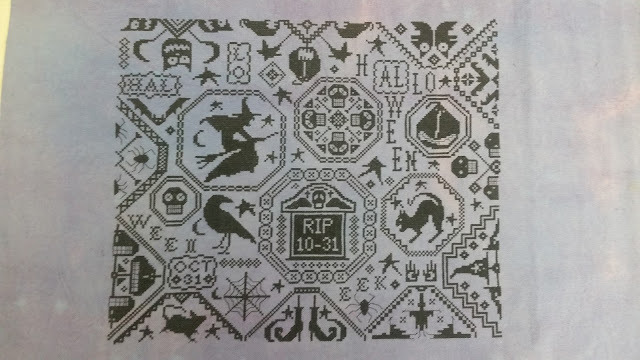 The bat is a LK pattern "Velcome", an oldie but a goodie. The bat himself is literally made out of felt and pipe cleaners (my crafting skills have gotten better I swear!) 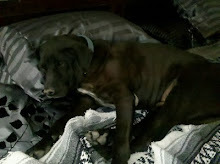 but I still love him. The basket on the table is new this year, a little spiderweb bowl from Kohls for holding all my little ornaments. 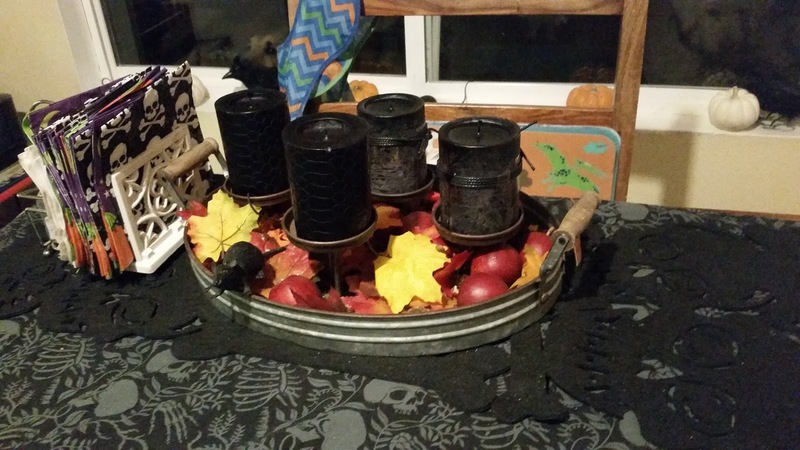 And this is our fall/Halloween table. I found the candle tray at Hobby Lobby. I was going to fill the bottom with little skulls or eyeballs but kind of like the little rat peaking out from under the leaves. And my kitchen seasonal wall. 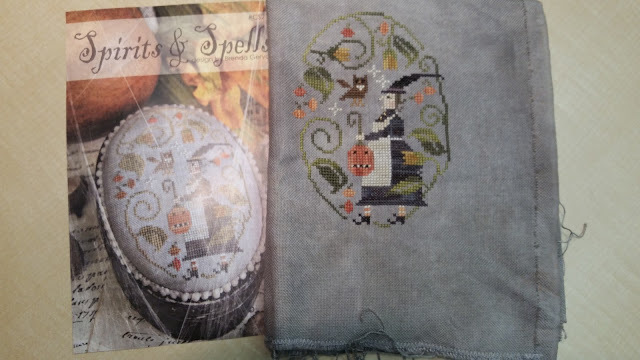 In the middle is my Mirabilia "Trick or Treat Fairy", on the right is a Barbara Ana "Halloween Stack", and then lots of little stitched ornaments. I'll have to do a close up tour during the day when I can get some better pictures. Here is my bedroom dresser with all of my Jim Shore witches up safe and out of reach. The little goat on the right hand side is new this year, and he is so cute and primitive. His little beard is real wool. I have to laugh though about my toddler, he begged to hold the goat and I told him no knowing he would rip the wool right off his chin. So as I am leaving the bedroom I hear sweet little toddler turn to dad and ask him to get his stuffed animal (the goat) down off the dresser- hoping dad would assume it was just another toy and give it to him. Can't beat kids and their sneakiness sometimes. And i'll finish with some cute photos of said toddler. This was a weekend trip up towards Flagstaff. 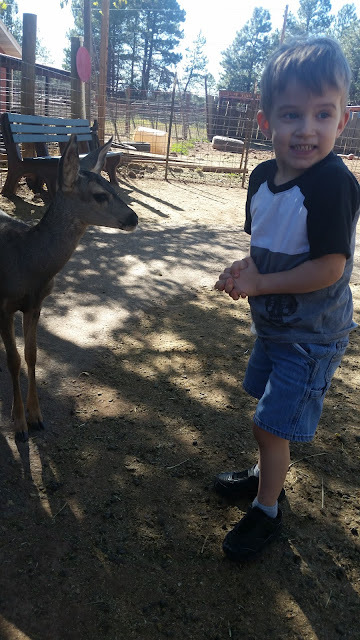 We went to the Grand Canyon Deer Farm. They let the deer roam free, and they will eat right out of your hand. 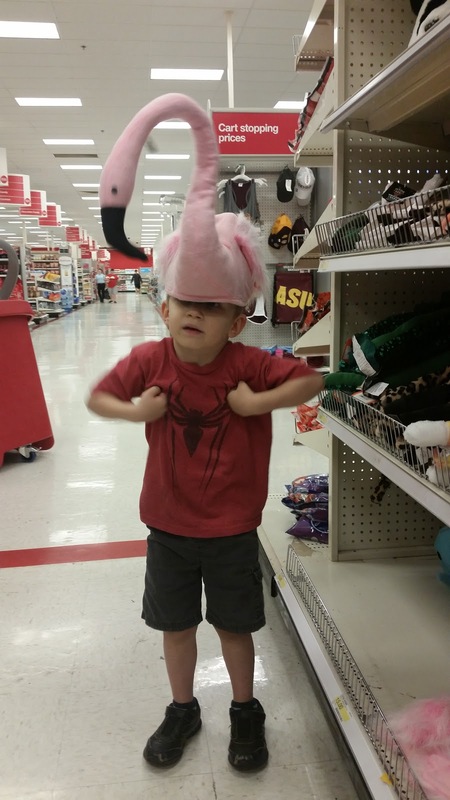 Below is him trying on Halloween costumes in Target, if you can't tell he is doing a chicken dance while wearing a flamingo hat! Yikes, I haven't posted since June! 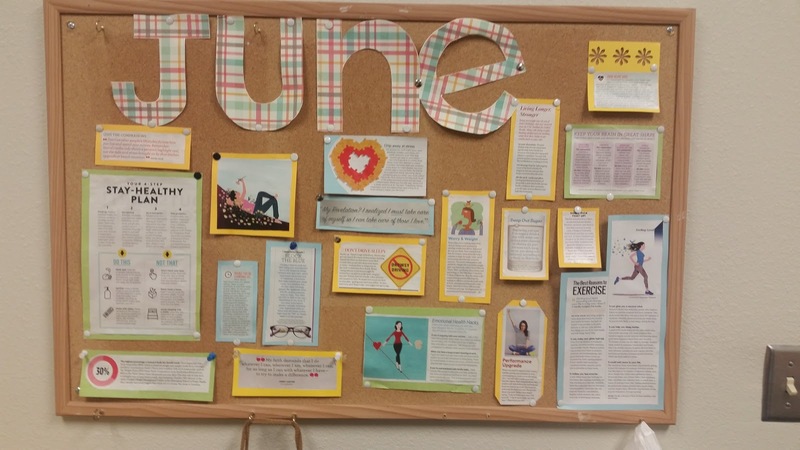 Summer has been busy this year, and I am looking forward to the routine of the school year. We spent summer at the beach and Disneyland and in our pool. Of course our air conditioning had to give out for three days in the middle of July which was no fun to suffer through but we survived. 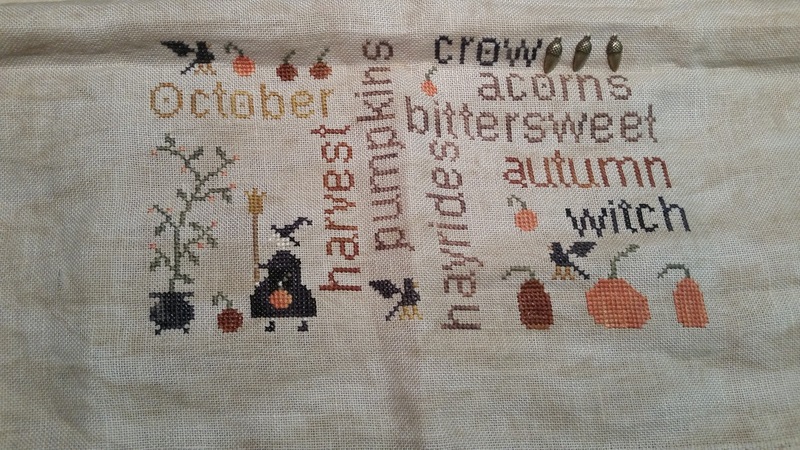 Obviously from my stitching choices I am also looking forward to Autumn, and fall decorating. Above is a Bent Creek WIP, Autumn Snapperland. When I started this I only had the squares and the barn done, so I have made some good progress already. Still trying to whittle away at my WIP basket. Kathleen sent me this project bag as a thank you for sending her some charts from my stash unload. 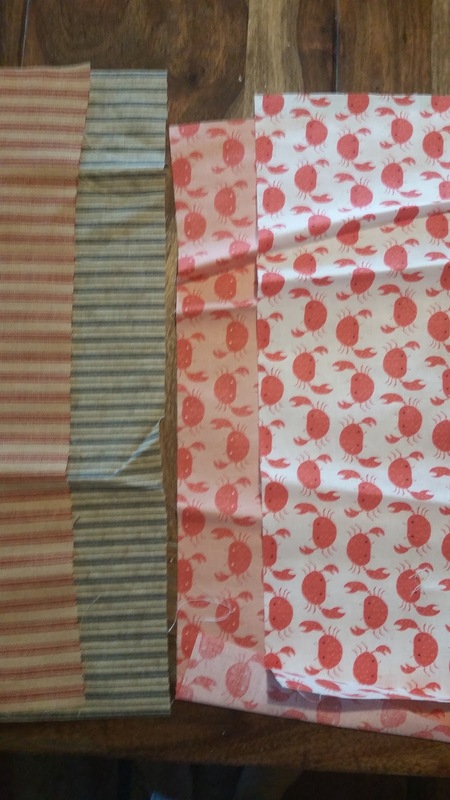 It is so cute, it has pink gingham fabric on the inside, and then the little pink fairies on the outside. I am already using it to take my stitching back and forth to work with me. I may have to watch some of the tutorials to figure out how to make more of these for myself. Until now I have just been using gallon Ziploc bags. More of my Wordplay Charts. I started on September (photo below) but of course was itching to start on October. So I have been working on them both at the same time. You can see which one has gotten more attention, ha! I love the little witch and pumpkins and crows. What I've been reading this month: Beneath a Scarlet Sky by Mark Sullivan. I cannot say enough how good this book was. It is about WWII in Italy, I did not know much about this part of history when I started the book. The narrator is a driver for a Nazi general stationed in Italy. The general started his career as an engineer, and is in charge of supply and ammunition. His character was interesting in that he did not support most of the atrocities of the Nazi party and he had the mindset that if they were going to win the war the countries they conquered shouldn't be left hating them. Some of the book is of course very sad, but it was a very good story with great characters and is based off of a true story. Highly recommend it. What I've been watching this month: The Girl With All the Gifts. This is a British zombie movie that just came out last year. I don't remember seeing it in theaters here, but it may have been (we don't get out to the actual movies too often with a toddler at home). I like zombie movies, but don't like overly gory/bloody movies (I know that's a contradiction in itself). Scary=ok, Gross= no thank you. This one had a really interesting premise/twist to it, and was not overly gross. The end of the movie made me really pause and think. I just love taking a chance on a movie I haven't heard of before, and having it turn out this good. Here's my latest new start, Lizzie Kate "A Little Boo". I love love love the colors on this one, Halloween is kind of my thing! I hand-dyed my own fabric for this one, using RIT Pearl Gray. 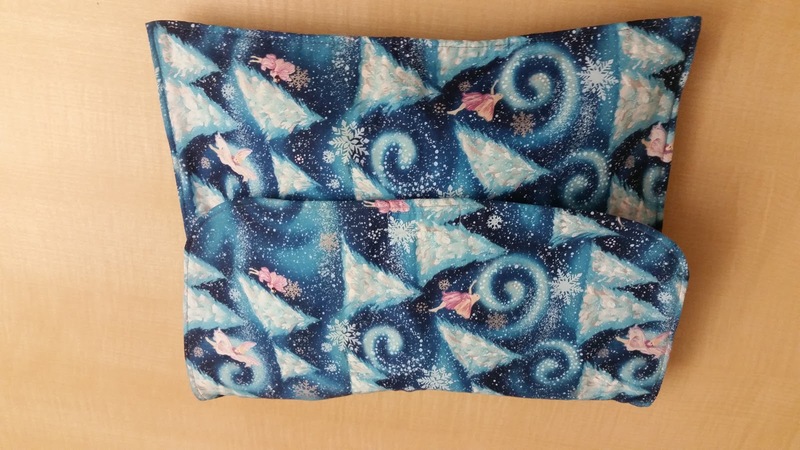 It doesn't show as well in my picture, but the fabric turned out nicely variegated/mottled. I also did some finishing this week. 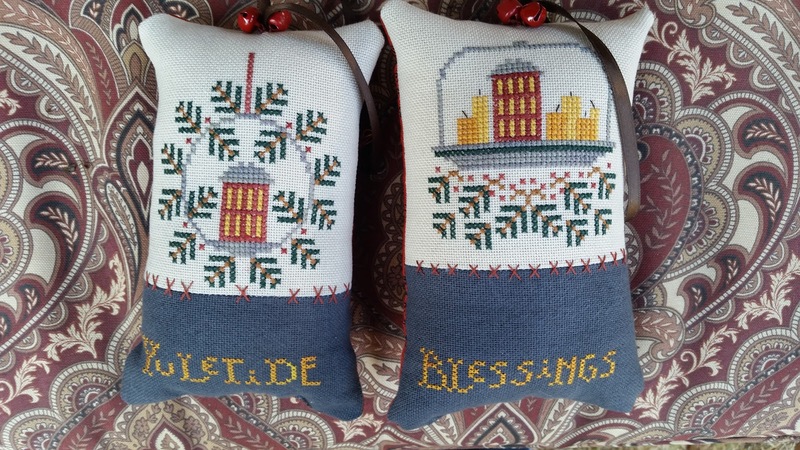 These two were a Hands on Design, from Just Cross Stitch (the 2016 Ornament issue, and the November? regular issue). 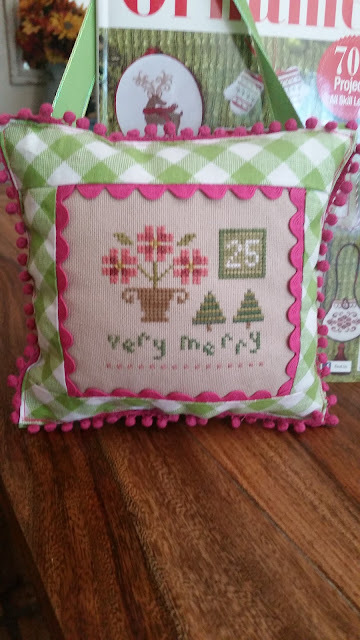 I loved the two different fabrics sewn together, but wish I had sewn the wording further up on the bottom. I'll just keep reminding myself it's supposed to look primitive. 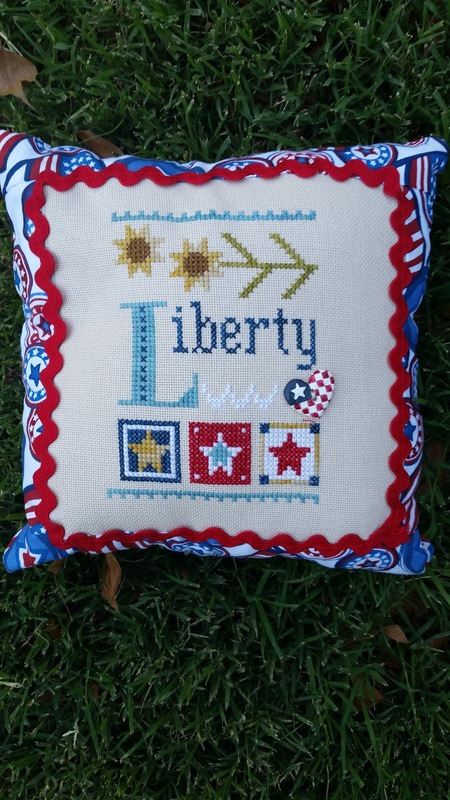 And another finish this week, Lizzie Kate "Liberty". These were her seasonal designs for this year. 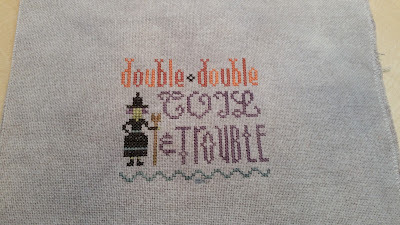 I already stitched the St. Patrick's day piece, and the Halloween one should be in my mailbox sometime this week I hope. The little button on this one was supposed to be stitched in white, but yet again my white was not showing up as well on the fabric. I liked the button, and used it on my other LK finish this week "Let Freedom Ring" also (in the bottom left of the photo below). 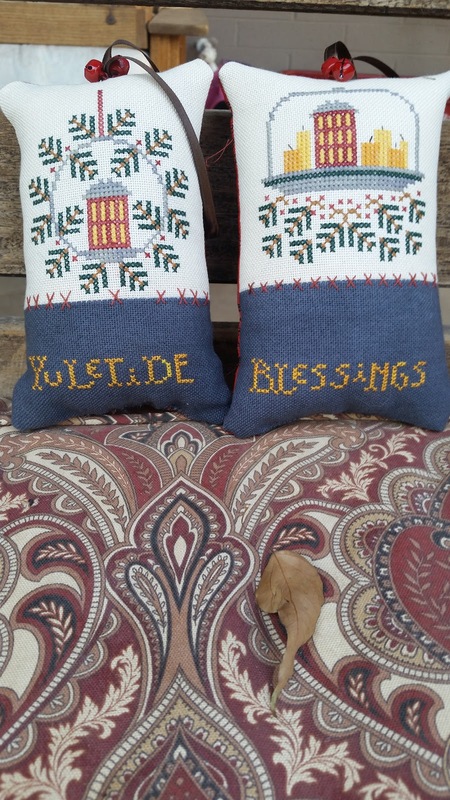 So i'm going to do that one as a smaller matching pillow. Here is what Friday night at my dining room table looked like. I pulled out all of these recent (and some not so recent) finishes, and got out my sewing machine so I could finally display them. I am stingy with my fabric sometimes, and will stitch multiple smalls on the same piece, so I have to wait to finish them until I have them all stitched. 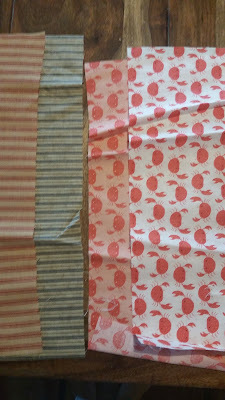 I also don't like stitching on small scraps which is why I don't cut them apart first. Below is the bottom of the ornaments I just finished, stitched in between a few of the Year in Chalk series from Hands on Design. I didn't finish any of the Year in Chalk designs yet, but really should since they should be so easy to do as a flat fold. 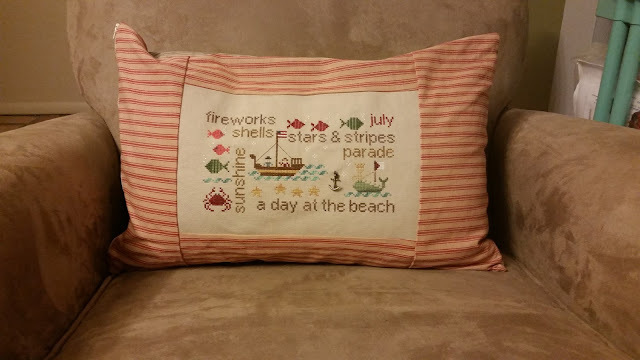 So that is all my random stitching for this summer. I did manage to move one more WIP off of my list. As the small WIP's get done, the list of large WIP's has started looming bigger. I think once I have made it through all of my smaller ones, I may start doing a rotation of working on one big WIP a month. Or I may just continue stitching like a hyper-active spider monkey-who knows! 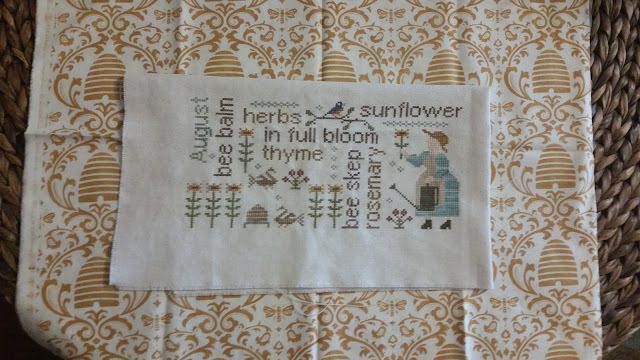 I also ordered fabric for my August pillow, but am not loving it, so am on the hunt for something with a smaller bee themed print on it. 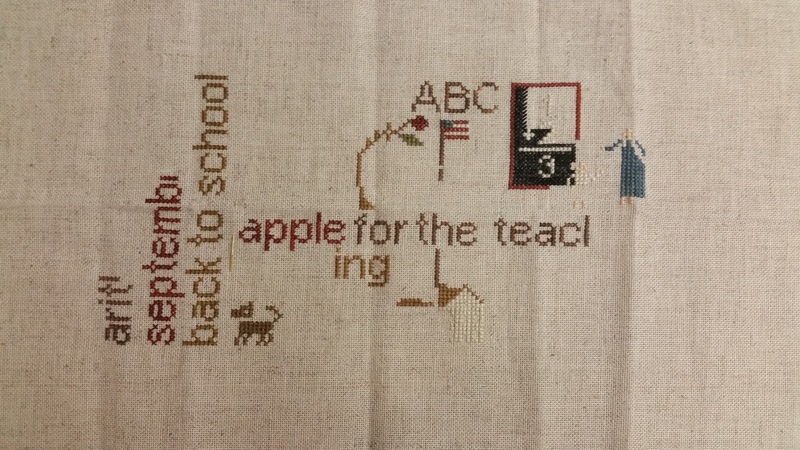 I may still use this one for the back of my pillow, but didn't want the pattern to overwhelm the cross stitching. I am still torn on it, but hoping I can find something I like a little better. 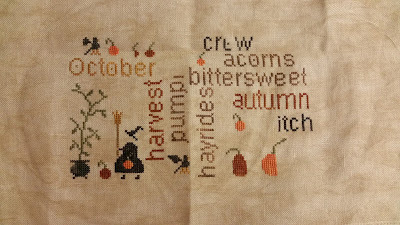 And here is my other stitching this week, the bonus chart from Lizzie Kate's Mystery Sampler (from 2013 I think). 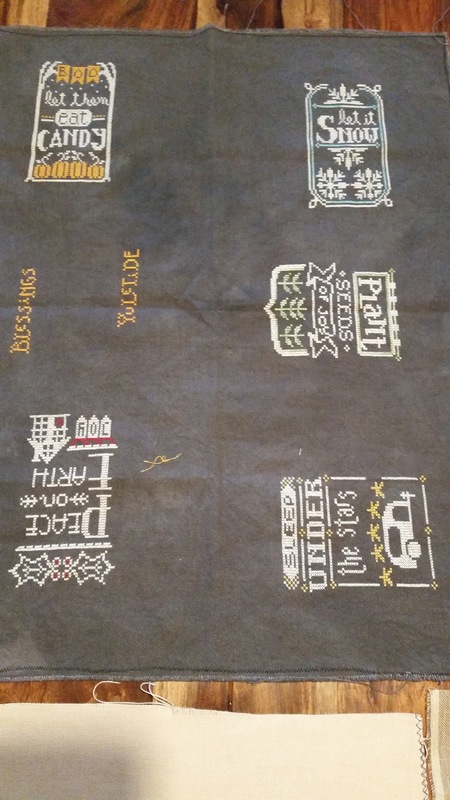 I want to stitch all three of these, but did not plan for the odd shape of my fabric very well. I probably have room to do all three charts vertically if I wanted to. 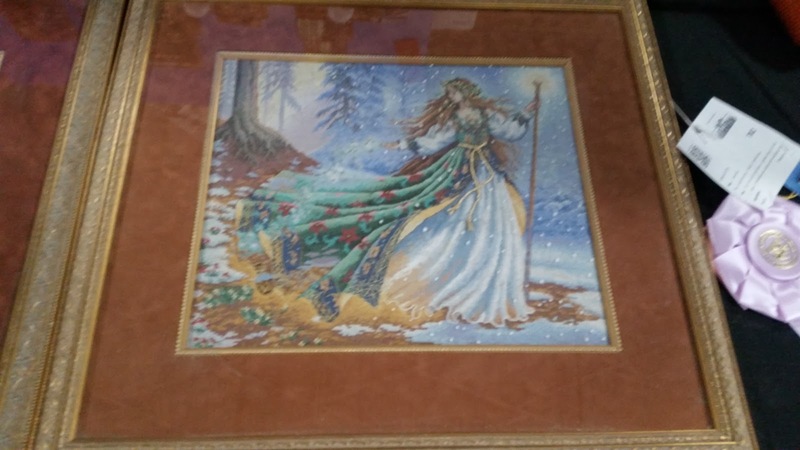 This was a piece I hand dyed from stash, and you can see I had already cut pieces off of it for other ornaments. The color was a RIT dye "Hibiscus" that came out a very dark violet, so I wound up bleaching to this kind of dusty medium purple. Sorry for the wrinkly fabric, I haven't had a chance to iron it out yet. And just a close up of the first design. I used WDW "Kohl" and like it better than "Onyx" for an all black chart. Not reading much this week, but I do have a movie recommendation. We watched "Passengers" this weekend, which just came out last year I believe. It has Jennifer Lawrence (Hunger Games), Chris Pratt (Guardians of the Galaxy) and Lawrence Fishburne (Matrix) as pretty much the only characters. But it was really good, not a total action movie but not slow either. I really liked the characters (though the bartender reminded me a lot of the Stephen King movie "The Shining"- I wonder if that was intentional). 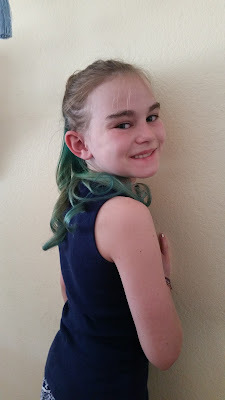 I also took my girls to see the new Pirates of the Caribbean movie, which was ok- about what you would expect for a movie franchise that has lasted this long. We went on a Thursday afternoon, and had the whole theater to ourselves which was kind of fun in itself. Guess what I finished? Yep, after five years "Thine is the Trick and the Treat" is DONE! 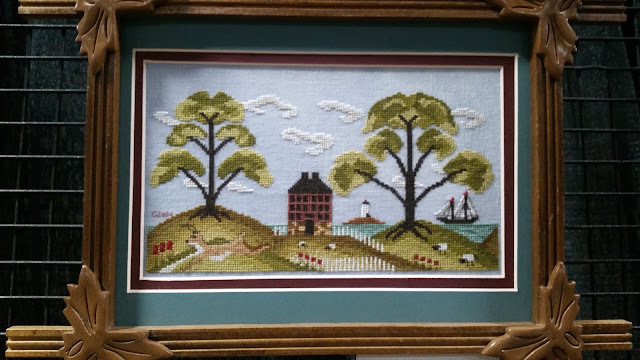 I liked stitching this one with just the one color, but sometimes it got tedious and I wound up using this as a filler project between my other more colorful WIP's. 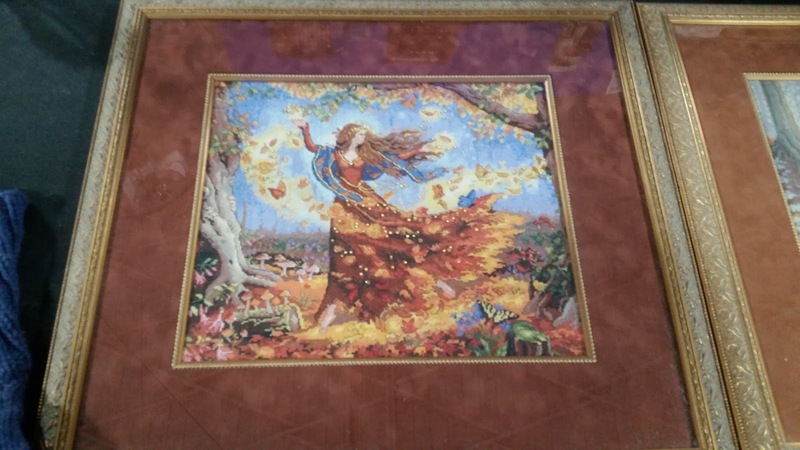 I am so glad to move this one out of my stitching basket, and I still love the design as much as when I started it. I was lucky to buy this chart when it first came out, as now I don't think I'd be able to afford it. Here is what else I have been working on this week. Our "Health" board at work had sat unloved for a while since the last person in charge of it went to another department. So I took over the project, and plan to try and update it each month. 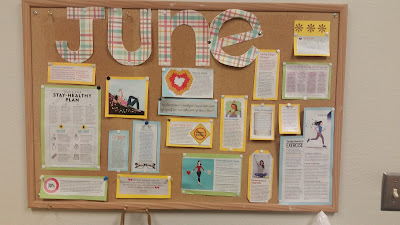 This hangs in our break-room, and I tried to include not just weight loss articles, but also clippings about stress and sleep and exercise. Hopefully it will at least motivate me to be a little healthier. Here's what I am reading this week, and actually just finished. "Gwendy's Button Box" by Stephen King and Richard Chizmar. It was almost more of a short story, but I really liked this one. You couldn't really tell where one author's sections began and the other one ended. 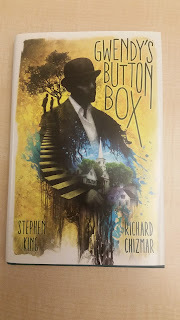 I love Stephen King books, so will be looking for some of Richard Chizmar's books now to see how they stack up. This one was not a typical horror story, no real monsters, but SK seems to have moved away from those lately in all of his stories. Here's my deal of the week. 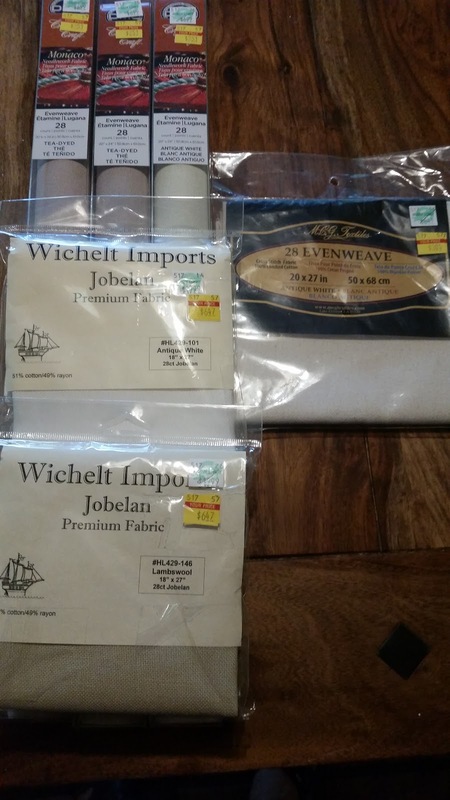 I found a few Wichelt Jobelan evenweaves at Hobby Lobby for half off, and 3 rolls of the Charles Craft evenweave for only $2 each. 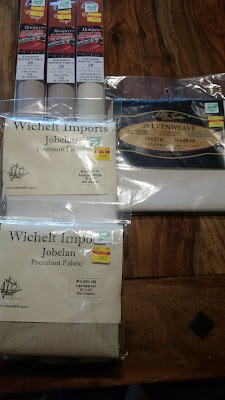 I am not super picky about what I stitch on, but do prefer evenweave over linen or Aida, so I was super happy to add these to my fabric stash. 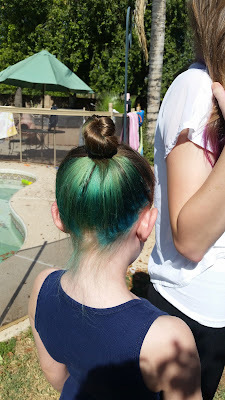 And my girls wanted to dye their hair again for the summer. 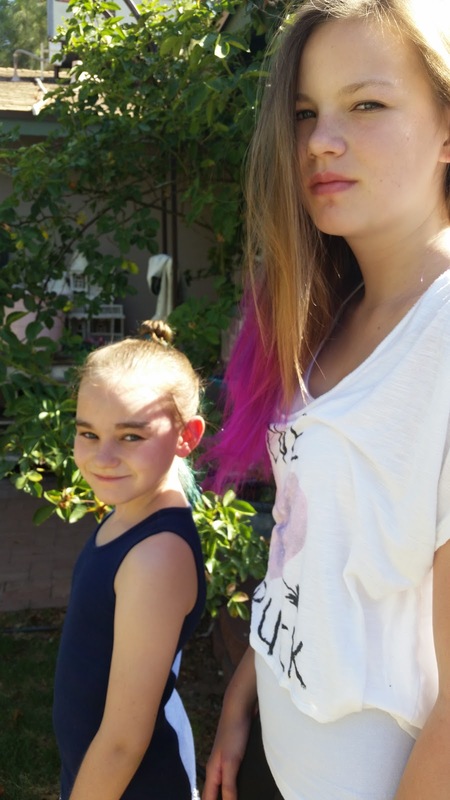 Their school requires uniforms and "neat" hair during the school year, so last summer we went wild and did bright pink on the ends of their hair. This year my youngest chose "mermaid" hair instead, and I think the turquoise turned out really pretty. My oldest wanted pink again, and I even did a small streak in my hair!